An all-in-one system for hard-hitting TrailblazerGirl skiers and boarders. 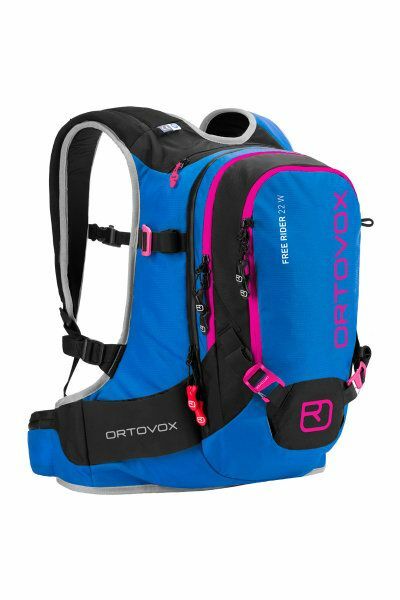 The Ortovox Free Rider 22 Woman is specifically designed to fit a woman’s body which is ideal in a backpack with an integrated back protector – “Spine Protector System” (SPS). A wide neoprene hip belt ensure the pack is hugged tightly to your body, and the SPS is conveniently removable and can be worn independently for times when you don’t need to carry a pack. This 22-liter pack has plenty of room to store your gear with great features like a separate compartment for accessories, fasteners for ski, snowboard, and helmet, an alarm whistle, and accommodation for a hydration system. Safety and practicality!